The post that got Jennifer Lopez a letter, according to Women’s Wear Daily. Image via Instagram. 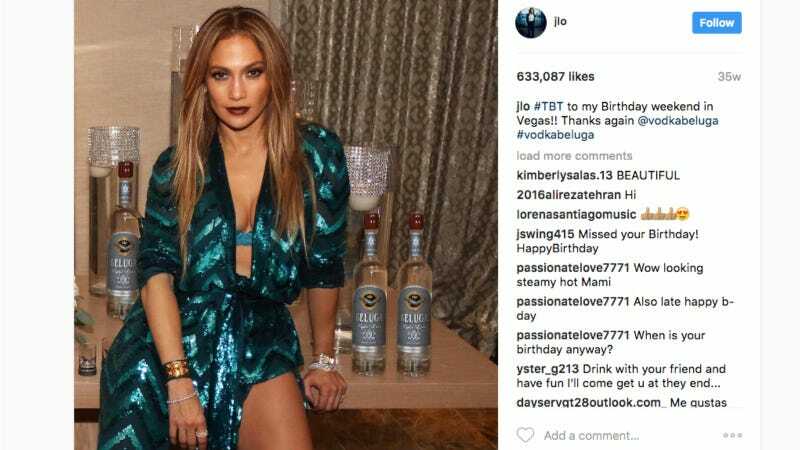 Last month, the Federal Trade Commission announced it had sent chiding letters to celebs and “influencers” who’d possibly been skating a little too close to the line when it comes to disclosing sponsored posts. Now we know who, exactly, got their knuckles rapped. WWD has obtained the 90 letters sent to 45 celebrities, their agents and the brands they were publicizing. Top celebrities included Sean Combs, Naomi Campbell, Sofia Vergara, Heidi Klum, Victoria Beckham, Allen Iverson, Lindsay Lohan... Scott Disick, Zendaya, Jennifer Lopez and Akon. In the fashion, beauty and retail space, letters were sent to Adidas, Chanel, Lorac Cosmetics, Chiara Ferragni Collection, Cabela’s, Johnson & Johnson, Eos Products, Matisse Footwear, Yves Saint Laurent and Puma. Many of the posts in question have been taken down by the influencers either at the request of the brands or their agents. A full list of celebrities and brands appears below. WWD also got the letters, which firmly reminded its recipients that disclosures should be “clear,” “conspicuous,” “unambiguous,” and stand out. Which defeats the purpose of paying a celeb to wave your product around on Instagram! But the FTC does not care. Update, 12:28 pm: The original version of this post said that Kourtney Kardashian was among those who received a letter. However, according to the FTC, this is incorrect and she did not. We regret the error. Update 2, 12:38 pm: The FTC has course-corrected, clarifying that in fact, while Kourtney Kardashian did not receive a letter, Popeyes did get a letter about a Kourtney Kardashian post, informing them about the importance of proper disclosures.